Are we getting hats this year, and if so, where and when will they be announced? I am told that my first draft (the sentence above) did not meet ELU's quality standards. Funny, I thought brevity was the soul of wit. Well, to pad things so that my question completely describes my problem: Are we getting hats this year, and if so, where and when will they be announced? The hats are already on this year! It's running from December 12th through January 1st this year. You can find a list of hats and how to get them here on MSE. 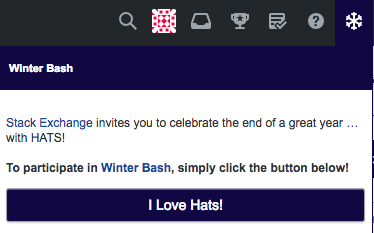 Alternatively, you can go directly to the Winter Bash site here. Not the answer you're looking for? Browse other questions tagged discussion winterbash .